Like a vacuum hanging over your stove, a range hood prevents cooking smells from filling your home, and stops vaporized grease from coating your cabinets. The hoods usually need to be vented, which can complicate installations. But the self-contained Greenhood can be suspended above a stove, vent-free. 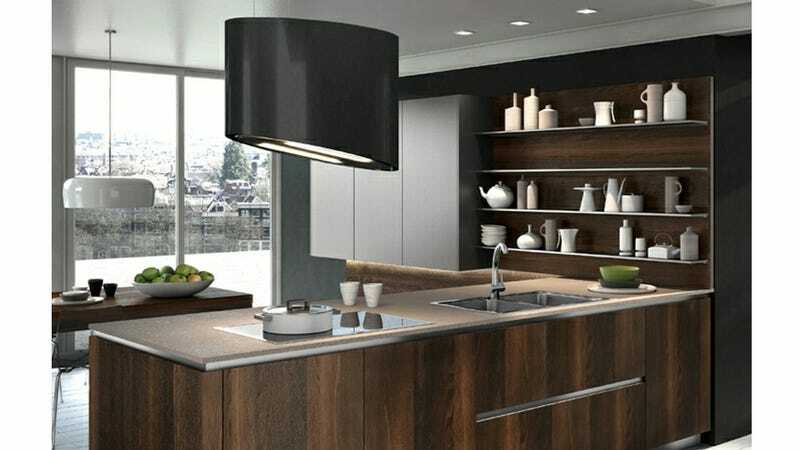 Created by Italian kitchen designer Snaidero, working with appliance maker Falmec, the Greenhood uses ionizing technology, like an air freshener. It eliminates smells and other harmful particulates in the air, like tobacco smoke, mold, and even viruses and bacteria. But eliminating the ventilation doesn't mean you can just hang it anywhere. The weight of the purification hardware and lighting requires precise rigging, and the Greenhood's power requirements probably mean reconfiguring the electrical service. Pricing info has yet to be revealed, but it's a safe assumption this would gobble up a good portion of your next kitchen reno budget.